Here up for sale is a. Set of Very Rare not reproduced Vintage. 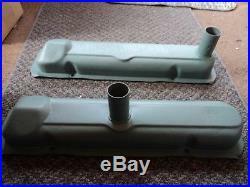 Used Original Catalina Bonneville Starchief Grand Prix lemans Tempest 1962 1963 1964 Pontiac 421 HO Valve Covers. 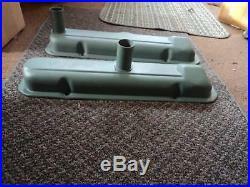 Pontiac Catalina Bonneville Grand Prix Ventura HO 389 421 428 425A Valve Covers. HARD TO FIND COVERS WITH OIL FILL STACKS AND INSIDE OIL SPLASH FLIPPER THAT KEEPS OIL FROM SPLASHING UP INTO THE BREATHERS, they have been media blasted and primed. 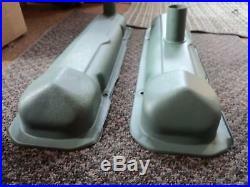 Real Original steel valve Covers NOT. With Tall Oil Stacks like the Super Duty. 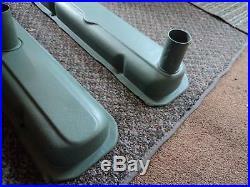 These would be good for 1962 1962 super Duty Clone. Please take a close look at the pictures.. Many pic's of all sides..
Feel free to ask any questions. The overall exterior edge dimensions are 20-1/8 x 5-3/8. Holes center to center are 10-1/2' and 4-1/4' side hole center to side hole center. Also, the interior height is about 2min/ 2-1/2 max to mounting flange? High Performance High Output Pontiac. SO GRAB IT IF YOU NEED IT. Or Deuce coupe Rat Rod Hot Rod project. Please ask any question and I will respond ASAP. Model T Ford DODGE BROTHERS CHEVROLET PONTIAC ACE APEX WILLY'S WHIPPET TERRAPLANE STUTZ STUDEBAKER STAR SINGER ROLLS-ROYCE REO PLYMOUTH PIERCE ARROW PEERLESS PACKARD OVERLAND OAKLAND NASH MARQUETTE MARMON LORRAINE LOCOMOBILE LINCOLN LAFAYETTE KLINE KISSEL JORDAN JEWETT HUPMOBILE HUDSON GRAHAM PAIGE FRANKLIN ESSEX DUREANT DETROIT STEAM DE SOTO CORD CADILLAC AUBURN AMERICAN STEAMER MASSEY FURGUSSON JOHN DEERE Farmall, Case, Allis Chalmers, John Deere OLIVER TRACTOR PONTIAC RACE PROGRAM. 1930 1931 1932 1933 1934 1935 1936 1937 1938 1939 1940 1941 1942 1943 1944 1945 1946 1947 1948 1949 1950 1951 1952 1953 1954 1955 1956 1957 1958 1959 1960 1961 1962 1963 1964 1965 1966 1967 1968 1969 GTO JUDGE AMC AMX DODGE MOPAR SATELLITE CHALLENGER MUSTANG SHELBY. GREAT ADDITION FOR THAT HOT RAT ROD. 55 56 57 58 59 60 61 62 63 64 65 66 67 68 69 70 71 72 73 74 75 76 77 78 79 80 81 82 83 84 85 86 87 88 GM dodge plymouth CORONET SATTELITE SATELLITE ROAD RUNNER CHALLENGER Chevrolet CORVETTE CHEVELLE IMPALA camaro COPO YENKO CHEVYII MALIBU SS pontiac GTO 421 DUAL QUAD SUPER DUTY CATALINA 2+2 BONNEVILLE STARCHIEF 59 60 61 50 Cadillac AMC AMX JAVELIN FORD GALAXIE MUSTANG SHELBY GT FALCON COMET MERCURY CYCLONE. If you need them ASAP, please let me know and I will do my best to get them to you quickly. Parts are guaranteed to be as stated, please contact me right away with any concerns so we can work out. I always provide tracking numbers so I can verify you received it and so you can see where it is. Thanks and check out my other auctions. 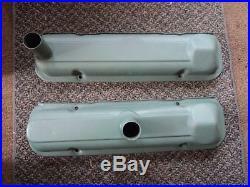 The item "1963 Pontiac Catalina Grand Prix Bonneville 421 HO Valve Covers 1964 Super Duty" is in sale since Saturday, March 31, 2018. 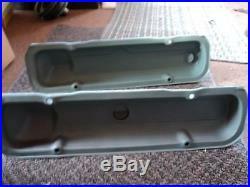 This item is in the category "eBay Motors\Parts & Accessories\Vintage Car & Truck Parts\Engines & Components\Valve Covers". The seller is "baddgoat" and is located in Waterford, Michigan. This item can be shipped to United States.